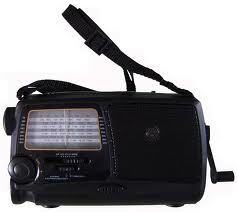 A dynamo radio is just one type of emergency radio that does not need batteries, an electrical outlet or sunlight. The word "dynamo" indicates a radio that is capable of operating via a motor that produces direct current when a handle attached to the outside of the radio is rotated for at least 10 or 15 minutes. One of the first electrical generators ever developed, the dynamo was a device that Thomas Edison declared would revolutionize electricity, but Tesla proved him wrong when alternating current replaced DC current. With the world today so dependent on electricity, any type of serious disaster that knocks out the power grid leaves millions of unprepared people crippled, helpless and in the dark. For those who anticipate catastrophes by stockpiling food, clothes and first aid supplies, having a dynamo radio included in those supplies can provide them with a way to stay in contact with the outside world in the event of a worst-case scenario such as a nuclear or wide-scale terrorist attack. A dynamo is a motor that generates DC current while a generator produces AC, or alternating current. 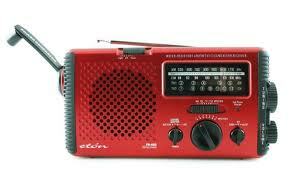 Emergency radios using crank power are able to work without electricity or batteries because of devices called commutators that convert AC current into DC current. With the interaction of wire coils, a structure called a stator that generates magnetic fields and an armature that facilitates displacement of electrons, a dynamo can power an emergency radio in any environment by cranking the radio's external handle. Weighing only one and a half pounds, the Eton FR400 is also water resistant and holds up well in excessively wet or humid conditions. The Midland Radio ER102 not only supplies weather warnings but also child abduction, nuclear power plant, biological hazard, fire, landslide and civil emergency warnings. Weighing less than one and a half pounds, this radio works in such extreme temperatures that go as low as 14 degrees and as high as 120 degrees Fahrenheit. 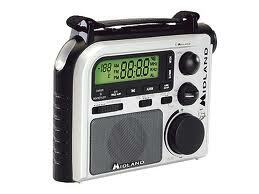 Additionally, unlike other radios the Midland comes with an AC adaptor as well as a detailed operation manual. A dynamo radio can also come equipped with General Mobile Radio Service (GMRS), a two-way radio technology that enables users to talk to other users who are also using this kind of radio. Other features to look for when purchasing an emergency radio include channel scanning capability, at least a one year warranty, rugged exterior material and high/low power settings to conserve power when necessary.